Dragon Ball Super: Broly is out in several markets, and fans have flocked theaters to check the film out. Still, there may be some things fans missed on their first watch through, and someone just shared one of those moments with fans. Dragon Ball Super: Broly, they will know things do not go so well for Beets. 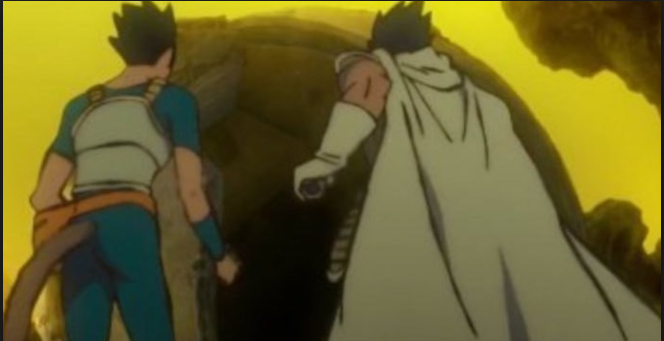 The Saiyan just happens to be in the wrong ship at the wrong time as Paragus jacks his vessel following King Vegeta’s exile of Broly. Unable to stop the older man, Beets helps out the older man search for his son, but things take a turn when their spaceship gets stranded on the outer planet. With Beets panicked, Paragus decides the best thing he can do is kill the younger man. Broly’s father offs Beets with a single blaster shot, leaving his body behind. The choice was made to conserve supplies as Broly and Paragus wanted as much sustenance as they could to survive. However, the duo were not done with Beets just yet… not by a long shot. As you can see above, it turns out that Broly and Paragus scavenged supplies from the dead Saiyan. As Broly grew older, he would need clothes, and it seems he took Beets’ pants, arm bands, and boots. As for Paragus, the fighter took Beets’ pouch to store his control device for Broly, leaving the corpse with his top and Saiyan armor so far as fans know. That is, unless the survivors straight-up ate Beets when their supplies dwindled… but that possibility is best left up to fans to decide.